We’d love your help. Let us know what’s wrong with this preview of Breakdown by Lynn Nanos. Using vignettes based on real interactions with patients, their families, police officers, and other mental health providers, Lynn Nanos shares her passion for helping this population. With more than twenty years of professional experience in the mental health field, her deep interest in helping people who don't know how to request help is evident to readers. To ask other readers questions about Breakdown, please sign up. This was a very interesting , well written book . The author , who has been a social worker for many years has very definite ideas on how to fix a broken system . Her vignettes about her troubled patients and their families were written with great sensitivity. Lynn, There is no one that can read your book BREAKDOWN and not give this book a 5 Star Review, as well as applaud your knowledge and efforts from your experience, and the factual statistics and vignettes you provide throughout your book unless the reader is in denial. You expertly present your findings in a precise, chronological and methodical style. Your book is written on a level that the average layperson, without a background in psychiatry, psychology, social work, et cetera can comprehend. I commend you for your insight, concern, compassion, care, and empathy, through writing this book to bring into the open that which has been covered-up and overlooked for far too long; when deinstitutionalization began, it led to severely mentally ill patients being released into mainstream society, thus resulting in a significant increase in homelessness, criminalization, and violence of today. I have immense respect for you for testifying at the Boston State House in favor of a bill to implement Assisted Living Outpatient Treatment (AOT). I am appalled after reading your book and digesting the information regarding the number of seriously mentally ill persons that remain untreated living in the United States; this is not only disgraceful to the U.S., but it is also frightening. I would love to see you take your book and your research to the Senate and testify on behalf of all the mentally ill in our country. An expense I know, but if you could find the means to provide all state Senators with a copy of BREAKDOWN, and pummel them with the data from your extensive research, I believe you could break through deaf ears. I understand you are fighting for Massachusetts, but when I read, “The criteria for meeting the legal definition of insanity vary from state to state,” I was aghast. The criteria, the treatment, the programs should be consistent throughout the United States, no exception. I was not shocked however, to read the commonality of a mentally ill patient being diagnosed by multiple psychiatrists with one mental illness and another psychiatrist changing the diagnosis. There have been many mental health professionals recommending that all of those involved in the mental health field read BREAKDOWN. However, I believe we have an epidemic and your book should be read by state Senators and Representatives to pass bills to be mandated in all states, including the criteria for meeting the legal definition of insanity. Your book should also be read by laypersons in order to understand their responsibility in speaking out to prevent violence and killings. Things will not change until professionals such as yourself, and communities as a whole work to stop the epidemic. 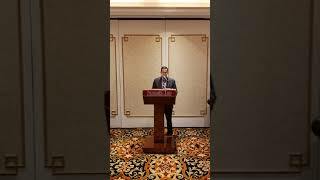 Of course, you will have to finesse the backing of The Department of Mental Health (DMH) and the National Alliance on Mental Illness (NAMI), And I find it disturbing that these two organizations do not support adherence to psychiatric treatment. It has to feel as if you are fighting a fight that cannot be won; however, after reading your book, I believe in your ability to push the critical information and data out to the masses. Thank you, again, Lynn for writing a book filled with crucial information and data. It is my hope that those who read BREAKDOWN will be affected by the degree of demanding change and inciting a movement for those who have a severe mental illness. I am going to share some excerpts from your book in hopes of inspiring more people to read BREAKDOWN. You are doing amazing work, and I appreciate all that you have done and continue to do. Excerpts from BREAKDOWN by Lynn Nanos, L.I.C.S.W. These excerpts do not begin to cover the extensive information and data that Lynn Nanos provides in her book BREAKDOWN, but my intent with what I’ve shared is to wake up the general populace to why innocent children and adults continue to be slaughtered by those who are seriously mentally ill, unmedicated, and we lack the legislative laws to untie the professionals hands to do anything about the loss of life at the hands of the mentally ill. I implore those who read this review to share it, whether you reblog this post, tweet it, or share to Facebook. 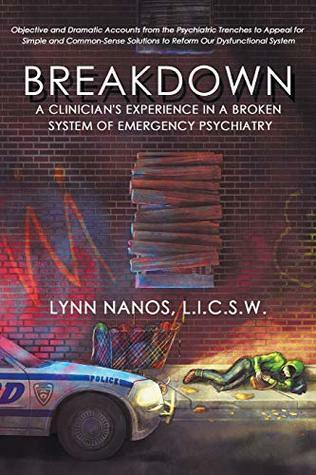 But what I would ask more is for you to purchase and read BREAKDOWN by Lynn Nanos, L.I.C.S.W., and then share her book with others. Advocate for mental health reform to tackle this epidemic. As a last note, Nanos speaks to so much more in her book than the few excerpts I shared to get your attention. You will be shocked at the numbers, the obstacles and the non-existent laws to keep the public and the mentally ill safe. I have never given a book my STRONGEST recommendation until now. I went on the Treatment Advocacy Center’s website last night and was shocked by what I read there, along with the numbers provided regarding those with mental illness and the consequences of non-treatment. You read about some of the consequences in the excerpts from BREAKDOWN by Lynn Nanos, L.I.C.S.W. Read the book and then visit the Treatment Advocacy Center’s website. And then do something to help allay this epidemic. Thank you, Lynn, for being persistent with me to read and review this long overdue and valuable book. My hope is between your book, your research, people affected by mental illness, whether parents, siblings, friends, those who read your book and get involved, et cetera., is that this will become the beginning to an ending. This a very good book that outlines the problems and offers solutions to the American system of mental health care - in about every area that there is - from intake to long term help, programs, laws, and more. It references many types of patients - people who are bipolar, schizophrenic, and more. It references lots of great sources and outlines not only the problems (from a first-hand view) but also the best solutions to the processes at all levels. Breakdown includes fifteen testimonials from well-known professionals, including attorneys, psychiatrists, authors, and professors! Every review of it on Amazon is a 5-star! Lynn Nanos is a Licensed Independent Clinical Social Worker in her eleventh year as a full-time mobile emergency psychiatric clinician in Massachusetts. 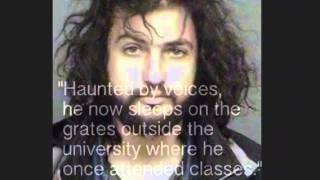 After graduating from Columbia University with a Master of Science in Soc Breakdown includes fifteen testimonials from well-known professionals, including attorneys, psychiatrists, authors, and professors! Every review of it on Amazon is a 5-star! Lynn Nanos is a Licensed Independent Clinical Social Worker in her eleventh year as a full-time mobile emergency psychiatric clinician in Massachusetts. After graduating from Columbia University with a Master of Science in Social Work, she worked as an inpatient psychiatric social worker for approximately seven years. Nanos is an active member of the National Shattering Silence Coalition that advocates for the seriously mentally ill population.